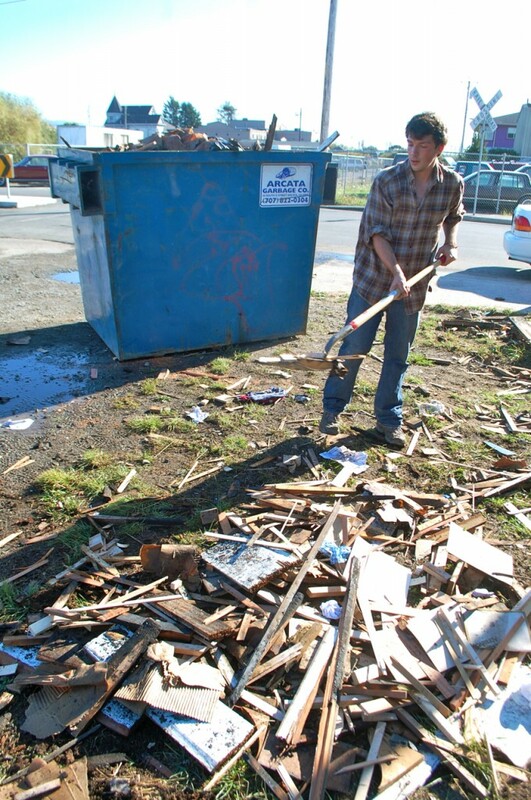 ARCATA – Firefighters responded the night of Monday, Oct. 18 at around 11:37 p.m. to a report of a dumpster fire at the intersection of 10th and L Streets in Arcata. Upon their arrival, they found a pile of debris burning next to 1310 L Street with fire extending into the walls of the 108-year-old building. Arcata Police officers had already assisted with controlling the exterior fire with a fire extinguisher. The automatic fire sprinkler system had activated and kept the fire from extending through the interior of the building which houses furniture making shops. However, the fire was burning in the wall spaces of the balloon-framed construction. Firefighters immediately attacked the fire and used chain saws to open the walls and stop the fire spread. It took 25 firefighters nearly 90 minutes to control the fire. Additional fire units responded to the scene and included personnel from the City of Eureka and Blue Lake Fire District. Engines from Humboldt Fire District and Westhaven Fire provided coverage for Mad River and McKinleyville stations. The 6400 square foot building suffered damage to the exterior siding and framing along with water damage to the interior. The building, with an estimated replacement value of $ 1.5 million was saved with an estimated $150,000 damage. The cause of the fire is under investigation. However, because the fire appears to have started in debris outside the building, the Fire District is asking residents to be diligent about leaving trash and containers outside their businesses. Residents and business owners are reminded to keep trash cans, recycle bins and dumpsters at least 5 feet from combustible walls and openings. Whenever possible, these containers should also be locked and kept in a well lighted area. This is the 14th suspicious fire in the City of Arcata in the past three months, with nine occurring this month alone. The Arcata Police Department and the Arcata Fire Protection District believe that a single individual may be responsible for setting the fires. The Arcata Police Department is asking anyone who may have witnessed any suspicious activity relating to these arsons or with any information as to the identity of the individual responsible, please contact the Arcata Police Department. This entry was posted on Tuesday, October 19th, 2010 at 5:25 pm	and is filed under News. You can follow any responses to this entry through the RSS 2.0 feed.